The Liber legis Scaniae: The Latin Text with Introduction, Translation and Commentaries forms the second volume of The Danish Medieval Laws and is dedicated to the Latin text based on the Danish medieval Law of Scania. Also known as the "Old laws of Scania", the Liber legis Scaniae is ascribed to Archbishop Anders Sunesen and traditionally belongs to the corpus of Danish medieval laws. It was translated from Old Danish in the thirteenth century and until now has often been considered a subsidiary text. 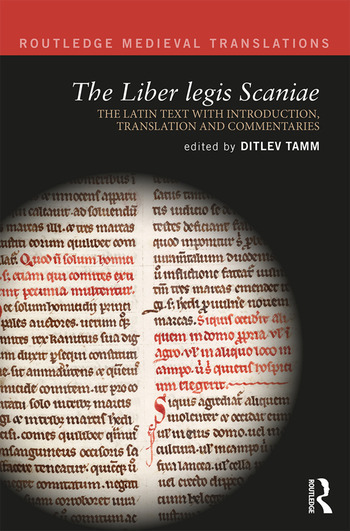 In this book, the importance of the Liber legis Scaniae is reexamined and its role in the first redaction of the Danish medieval laws is revealed as far more central than previously thought. This is the first time the text has been translated into English, and both the original Latin and the new English translation are included together. Beginning with a detailed introduction providing key information about the text, its author and its place in Danish legal history, and including a chapter dedicated to the Latin language of the text, this book will be ideal for students and scholars of medieval Scandinavian legal history. It also concludes with an extensive Latin-to-English glossary. 1. How did Andrew learn his Latin? Ditlev Tamm is a Professor at the Centre for Studies in Legal Culture at the University of Copenhagen. He has previously published in Danish and other languages, and his previous publications in English include The Supreme Court: A Historical Perspective (2015), the conference paper How Nordic Are the Old Nordic Laws: Ten Years Later? (2014) and (as editor with Helle Vogt) The Danish Medieval Laws: The Laws of Scania, Zealand and Jutland (2016).